The SBA Brings "The Show" and the Original DC Legends Back to its Roots in Jerrod Mustaf's home town of Whiteville, North Carolina. A little over 9 years ago the Street Basketball Association was created to further enhance the growth of the street basketball industry while giving the top professional street ball players a platform to develop their creative talents and entertain fans worldwide. 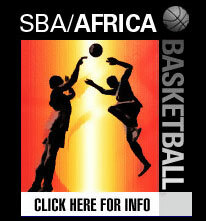 In an effort to market the emerging style of the Street Basketball Association, the SBA created the "The Show" a turn-key entertainment product used to demonstrate the authenticity of street ball, fusing basketball, hip-hop music, DJ's, Announcers, and Dancers (The Ouch Girls) together all in celebration of a style of basketball which has been played for years throughout inner cities of the U.S.
Back in July 2001, the SBA set up a number of games barnstorming throughout the east coast in an effort to market the SBA Show. The first of these games was played in Whiteville, North Carolina, where SBA CEO, Jerrod Mustaf is originally from. One of the first SBA games ever played in this small town featured players who have now made a name for themselves in the basketball world. It was at this game, when the SBA introduced Randy "White Chocolate" Gill and Hugh "Baby Shaq" Jones to the street ball scene. In addition, you had a young Chris Wilcox, now playing in the NBA dunking on everybody that day, D.C. Legend Curt "Trouble" Smith (Bone) showing why he is one of the best guards ever to do it, Victor "Sky" Page another D.C. Legend and Georgetown University Star, and Earl "Pep" Tyson (Harlem World) put on a show scoring 25 in the first half as well as using his patented criss cross/crossover to put two defenders on the ground. Yes, indeed this was one groundbreaking game. 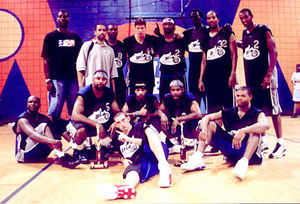 In addition, you had Greg "The Killer Cross" Jones (The Wizard) from the DC Legends and EBC Rucker Park Champion Fat Joe's Terror Squad, Charles "Flat-Out" Ward and Lou "The Smooth" White (Certified) who recorded 3 triple doubles last year in the ABA and is now working out with the Washington Wizards. This game was a prime example of "The Show" and gave the dedicated staff of the SBA all the motivation it needed to continue to build on its corporate mission. Now over three years later, the SBA decided it was time to celebrate its growth by bringing the SBA Street Ball Show back to its Roots in Whiteville. Yes indeed, back in Whiteville, you better believe the basketball enthusiasts were more than ready to check out the SBA Show as a capacity standing room only crowd was loud and excited from the opening warm-ups. The SBA All-stars featured Andre "Silk" Poole, who if you have not heard about it yet, (crossed up The Bone Collector on a move making him hit the floor in an instant SBA Classic battle down in Baltimore a few weeks ago). Silk entertained the crowd with a number of vicious cross-overs, ball reversal spin moves, and some silky smooth passes, leading the SBA team with 33 points. In the back-court with Silk was Pat-Da Roc who has more street ball tricks than anybody on the planet. This kid is a phenom with the ball; creating moves that no one has yet to match. At one point in the game Pat from half court shook his man with a hidden ball trick in which everyone in the crowd was in amazement (Pat Da-Roc is a magician with the rock), and then as Pat revealed the ball he bounced it behind his neck and back and then back heeled the ball, looking like the soccer star Pele, all the way to the front of the rim perfectly placed for an alley-oup for Baby Shaq. The combination move was incredible. As far as Baby Shaq goes, when you see this guy in person and get a chance to feel the power and see the quickness of this guy it is just amazing. Baby Shaq had a number of thunderous dunks and explosive moves leaving his man and the crowd in disbelief. And for you street ball fans out there that do not know yet, SBA All-star and DC Legend Hugh "Baby Shaq" Jones destroyed the And 1 crew averaging over 40 points a game against them playing in the last five games of the 2004 Mix Tape Tour. You can check out a few highlights from Baby Shaq on the ESPN Street Ball Show airing on ESPN and ESPN2. The SBA All-stars were also led by SBA originals' Greg "The Wizard" Jones and Lou "Certified" White who scored 24 and 20 points respectively. At one point, The Wizard hit 5 consecutive three-pointers from deep behind the arc demonstrating his awesome outside touch. David "Rodman" Bailey (aka, Dr. Dunkenstein) led the All-stars with 20 boards and gave the fans some added entertainment with his exaggerated celebration after his dunks. In addition, Jason "The Birdman" Williams, Zeke "The Freak", and Rashid "7 and Sum Change" Byrd added about 20 dunks between the three of them helping to flat out dominate the game winning by 52; the SBA All-stars defeated the No Limit Whiteville All-stars 142-90. The Whiteville team was led by Charles "Flat-Out Can Do It" Ward who tried his best to rally his team, scoring over a third of his team's points with 34.